Lactation Room Setup Guide - Setting up a lactation room (Breastfeeding Room) in a work office area is simple and easy. The main requirement is a space big enough to accommodate the basic amenities for one or more nursing mothers (breast pumping or breastfeeding). The room must be shielded from public view (meaning door must be lockable and any windows must have curtains or blinds). This space can be newly built or pre-existing space converted or repurposed as a dedicated lactation room. Since passage of the Affordable Care Act in 2010, employers with 50 or more employees are required to provide Reasonable Break Time for Working mothers. This includes providing the appropriate space and amenities to help them express breast milk when needed. Here is the lactation room setup guide. 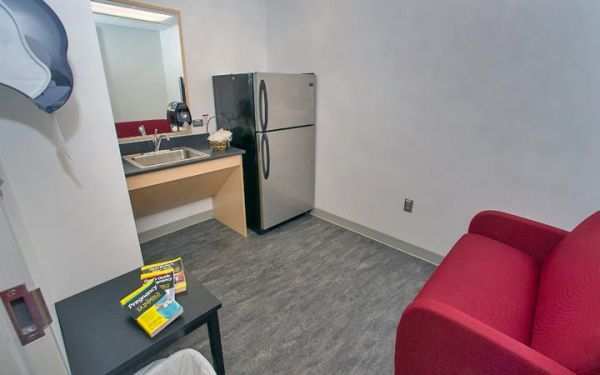 If however you're not able to provide a sink inside the room, you should at least have an alternate space nearby with a sink and running water such as women's restroom for mothers to clean their equipment after expressing breast milk. How to Set Up a Lactation Room - Detailed amenities for organizations, colleges, and universities (nursing rooms at work). While moms are encouraged to have their own backup manual breast pumps or connecting accessories for electric pumps, a quality electric breast pump is generally more effective for expressing breast milk and maintaining a mother's milk supply than a manual pump. Mothers who maintain their milk supply tend to breastfeed longer than mothers who begin supplementing their baby's diet with infant formula. Employees (staff and students in case of colleges/universities) can share an electric breast pump by staggering their break schedules. If you have more than 200 employees, consider purchasing more than one pump. A quality electric breast pump will last for years and is an excellent investment. Double pumping kits compatible with the electric breast pump for breastfeeding employees. A double versus a single pumping kit attaches to the electric pump, and allows mothers to express milk from both breasts at the same time. This is time efficient as it shortens the amount of break time needed for expressing breast milk. Pump kits are intended for one user, and are not shared, or returned. For mothers to store their breast milk separate from the employees refrigerator. If the employee is away from home, her milk is best kept cool. Employees may be more comfortable storing their breast milk separate from the employee refrigerator. (If an existing sink is not close to the employees work area) for washing bottles and pumping equipment. Great parts of lactation room design include bulletin board for employees to display pictures of their babies, and a audio player for relaxing music. A comfortable relaxing atmosphere encourages "let down" which is necessary for milk flow. This can provide additional comfort, particularly for women of short stature. Get started and create a lactation room now. Follow the Resource Links below to download a proposal letter to setup a nursing room or upgrade an existing breastfeeding room - pumping room space in your company. Designated Nursing Room Sign (8X10 poster) for doors and offices (Lactation Room Signage). Nowadays there are more than one convenient get a lactation space setup for active breastfeeding and breast pumping moms in your building or venue. Many airports, stadiums, convention centers, and other heavily foot trafficked places have either built new nursing rooms or convert unused spaces into one or have purchased portable lactation pods that are smaller, have the basic amenities for moms, and can be placed in multiple areas of large venues like airport terminals and stadium sections. Avoid creating a lactation space that can only be accessed through bathrooms or locker rooms. Make clear access to the electric outlet. Provide a microwave to sterilize breast pump parts.